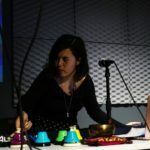 Melody Loveless is a Brooklyn based composer and creative technologist who experiments and creates works for digital media, and acoustic and electronic instruments. Her work is influenced by story-telling, science, crossing between mediums and genres, and interactive art. She has had the opportunity to work with many great musicians such as So Percussion, the JACK Quartet, Cadillac Moon Ensemble, Barnard-Columbia Ancient Drama Group, NEXTET New Music Ensemble, Washington Square Winds and NYU Contemporary Ensemble. She holds a M.M. in Music Composition from New York University – Steinhardt and a B.A. in Music from University of Nevada – Las Vegas. Currently, she is pursuing a M.S. in Integrated Digital Media from New York University – Polytechnic School of Engineering. Her past composition instructors include Joan La Barbara, Julia Wolfe and Jerica Oblack. She has studied percussion with Timothy Jones, Alex Stopa and Dean Gronemeier.